Hi! 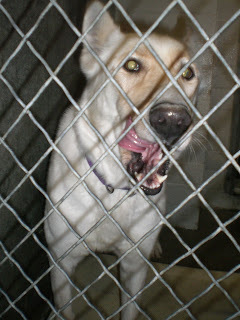 My name is Daniela, and I am a 3 year old female Siberian Husky / Lab mix, according to my kennel card. Susan the dog lady thinks I might have some Shepherd in me. 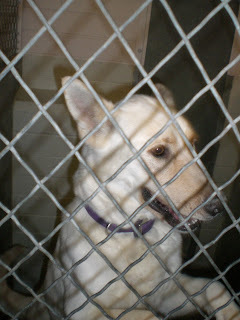 I was owner surrendered on November 17. Susan thinks I am just beautiful. I live in building 2, toward the front, on the right side as you walk in from the front gate. Susan was here at the shelter for 9 hours today, and she spent 6 of them cleaning and sanitizing the laundry room. 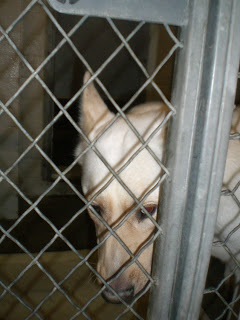 Unfortunately she didn't have much time to take very many dogs out, so she took pictures of me through the wiring. That didn't stop me from loving the treats she gave me though! You can see me licking my lips here! You can adopt a dog here for just $37. The shelter hours are normally 12 noon - 7 PM Monday - Thursday, 10 AM - 5 PM on Friday and Saturday, and closed Sundays and holidays. On Christmas Eve day (next Monday), the shelter will be open 9 AM - 4 PM. Hope to see you!